Bridger Shadows Farm is a beautiful 735± acre ranch that has been in the same family operation since the early 1940’s. The Bridger Mountains provide a stunning melodic backdrop with 360-degree views of the entire Gallatin Valley. Located just 5± miles north of Bozeman in the productive and striking landscape of Montana’s Gallatin Valley, this property offers endless possibilities to the new owner, including exquisite hunting, ranching and farming, equestrian possibilities, cross-country skiing, 4-wheeling, snowmobiling, hiking and land development or conservation easement potential. Within minutes of downtown Bozeman and Bozeman Yellowstone International Airport and a short 15± minute drive to Bridger Bowl Ski area, this historically agricultural area is also known for good pheasant, Hungarian partridge and deer hunting. A rare find, this property consists of a combination of rolling grassland and fields currently being used to raise wheat and barley. There are several areas of heavy brush which include multiple deciduous pine and cedar trees filled with numerous springs providing creeks, small ponds and water for livestock and wild game. 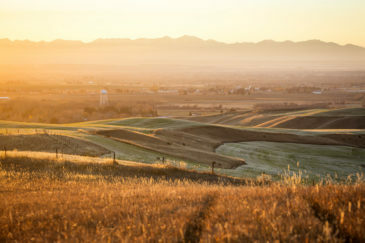 The terrain offers many possibilities for secluded, rural living within minutes of downtown Bozeman amenities. This large parcel provides 360-degree awe inspiring panoramic views of the Bridger and Gallatin Mountains along with the Spanish Peaks and Tobacco Root Mountain ranges. It is the largest acreage currently being offered with such close proximity to Bozeman. Bridger Shadows Farm - Bozeman, Montana from Fay Ranches on Vimeo.